Our Shiloh Shepherd "Ranger" is below. Ranger Productions is named in honor of him. Shiloh Shepherds are a wonderful rare breed. You may want to visit his breeder at Raid the Wind Kennels. To visit Ranger's web page, click on his picture below. 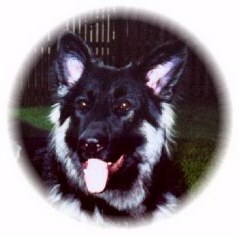 You are also invited to visit Ranger's pedigree site tracing his lineage back to the first German Shepherd Dog.